Weekend breaks, secret dates, and catching up with mates. It's a step into rural Northamptonshire, but offers the cuisine most often associated with gastro cuisine. On the way to our destination, The Narrow Boat at Weedon we stopped of at The White Hart, Flore for a light bite and a glass of something lovely before heading over to an amazing vintage outlet, Vintique Limited, which gives traders and customers an opportunity to sell and explore antique or up cycled collectibles. The fact that it’s located in the majestic Royal Ordnance depot is a real bonus. The buildings at the Depot date back to the first years of the 19th century when, in 1803, Britain was preparing itself to deal with the french menace – Napoleon. 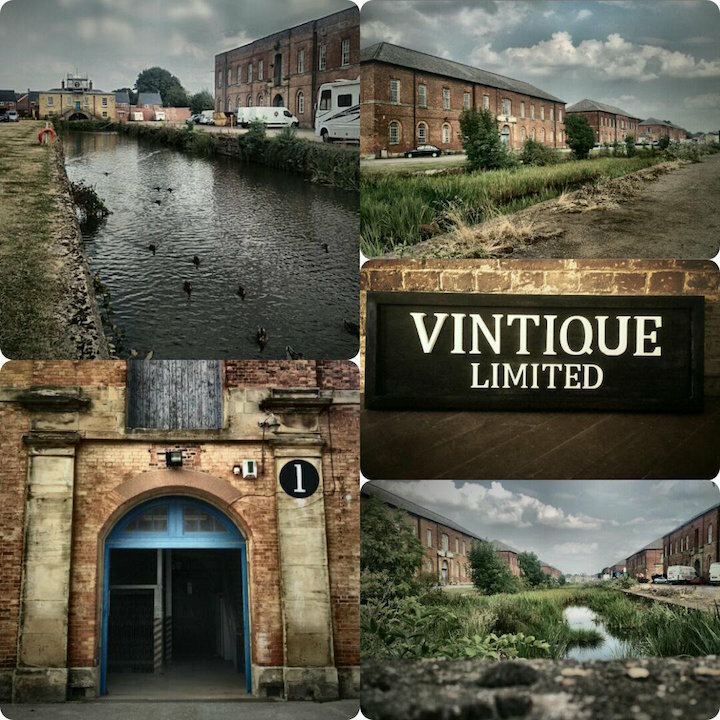 Back to 2017 and the encouraging news is that the historical warehouses are currently a source of huge private investment in the county and you can’t help but feel that the area will become a real attraction for us all in the next few years. 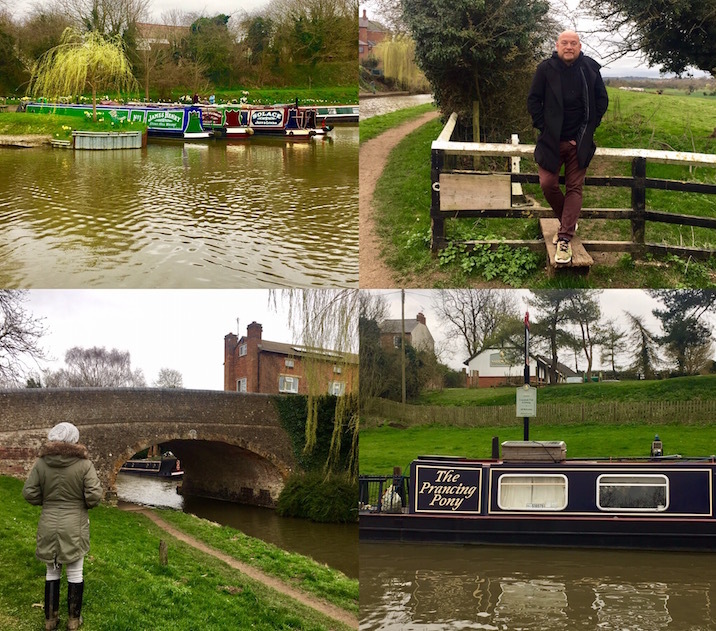 After a pleasant hour mooching at The Depot, we headed onwards on our short journey in anticipation of a stay at one of the most highly recommended pubs in Northamptonshire, The Narrow Boat at Weedon. As you head down the A5 and cross the Grand Union Canal, you may be forgiven for thinking that The Narrow Boat is just another version of a locally managed and well presented Charles Wells Pub, but that’s not the case. The Narrow Boat holds secrets. Lungs full of fresh air we head back to the pub, check in, and reward ourselves with a quick livener from the well stocked bar. I will simply point out at this stage that there are five types of sparkling wine ranging from Prosecco to Champers – with nearly all being available by the glass. AND dear reader, the glasses are chilled. That’s a big tick in the Muddy book. We then head back to our nearby accommodation, which is a really well appointed, modern and and stylish double bedroom with an en suite bathroom. It’s bijoux, but lovely, and the fact that it’s set away from the pub somehow makes us feel like we’re posh glamping, away from everyone; no hotel guests to bump into in the corridor. And so we have a half an hour snooze then don our glad rags, and head back over to the pub – the lights have been been dimmed and there is a buzz (although that could just be the excitement of being away for the night). We actually feel like we’re on a date and home could be a million miles away. In that sense, kids homework, parent taxi and constant phone checking simple don’t exist. I like this place already. The staff we met are very restaurant savvy and it’s clear that anyone staying at the pub is very welcome. 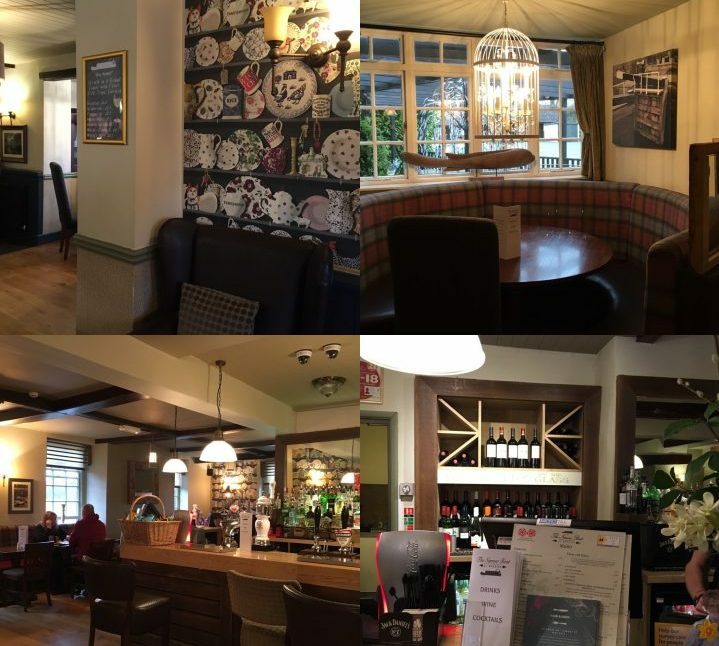 The food, wine and cocktail menus are very good but the friendly smiles, and accommodating nature of the team suggest that this isn’t “only” a Pub. There’s restaurant and bar area, we chose the bar and the food’s as good as anything you might find in a larger town. The Narrow Boat is good old fashioned Northamptonshire, rural hospitality with a modern twist (more of which below). And then of course, there is the pub’s not so secret weapon. Kirsty Collins, chef of imagination and quarter finalist of the Professional Masterchef. This lady knows her stuff and knows the local market – in terms of produce as well as its customers. Later, as we were coming to the end of our meal, Kirsty took time to talk us through her approach and she really is an impressive character. 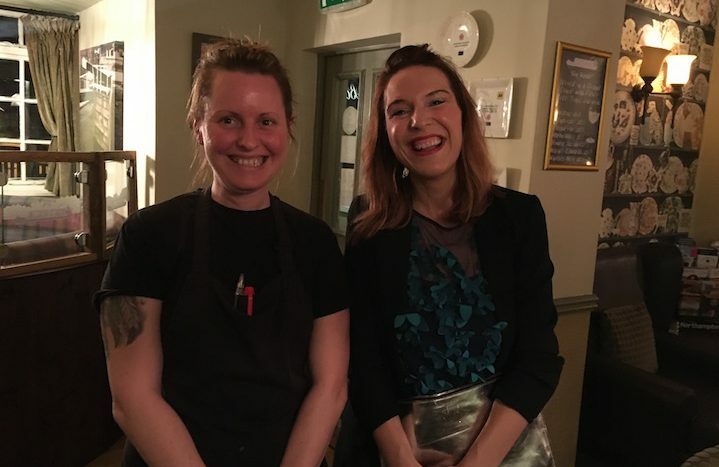 She explained the balance between finesse and quantity, and it’s true, pub diners like quantity, but Kirsty’s cooking ethos is very much based on flavour. 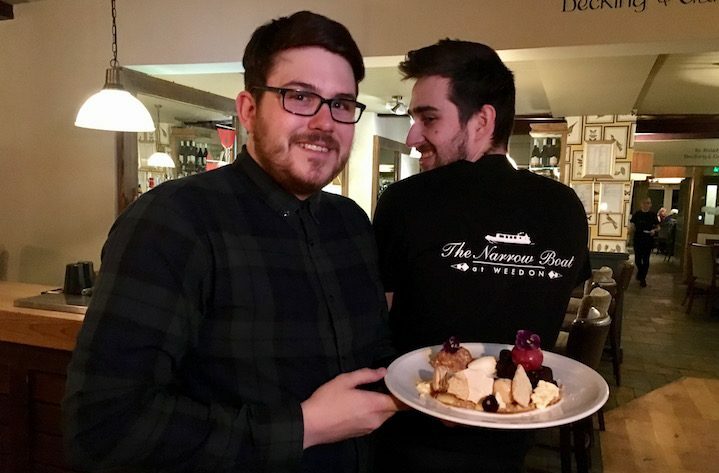 At The Narrow Boat the quirky decor is complemented by dishes that at a first glance suggest a pub menu, but there are enough twists and enhancements on practically every dish making the arrival of each course exciting and interesting. I know, enough with the ambience and location, let’s talk food. We satisfied our starter palate with a really ingenious Tandoori chicken kiev on a squash saag aloo, bursting with flavour, not too spicy (which I would have liked, but isn’t to everyone’s taste). Onto the main courses (we’d shared the starter to make sure we had room for the famous puddings). I plumped for an unusually generous and clever sea bass with lemongrass on vermicelli noodles, which took me a little be surprise. The size of the dish was impressive – so much so that I actually asked for some of it to be packed up for later, and The Narrow Boat were happy to oblige. 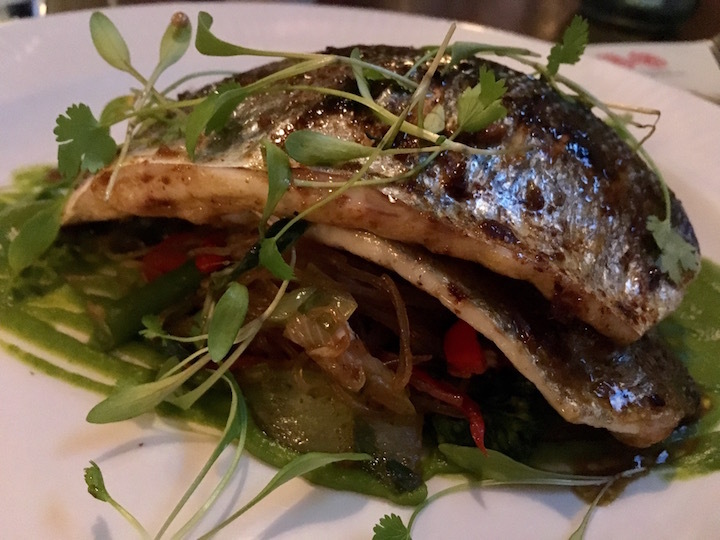 It’s all about the Double (sea) bass – see what I did there? 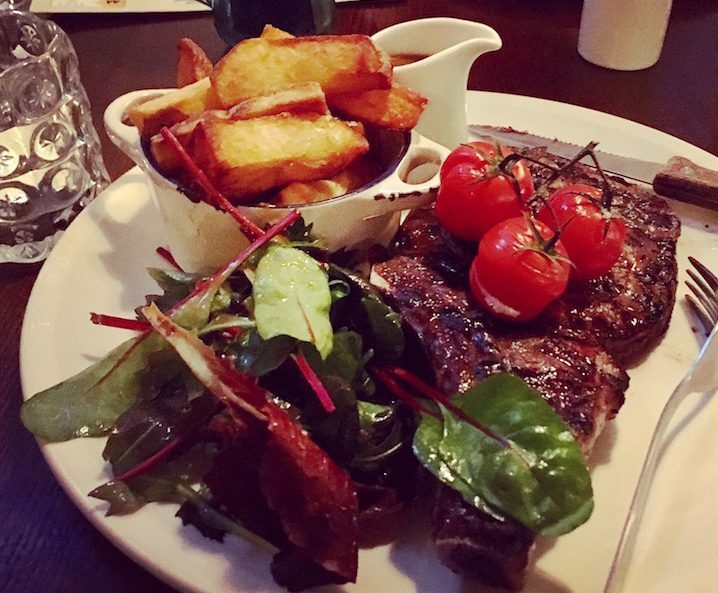 True to form, and having “been good” since new year, Mr Muddy went for the Cote de Boeuf, accompanied by truffle oil hand cut chips, roasted tomatoes and fresh salad. Although we did manage some conversation this was accompanied with ooh’s aahs, and general noises of satisfaction. Imagine a role reversal of ‘that’ scene from When Harry met Sally. Really, his enjoyment was almost obscene. 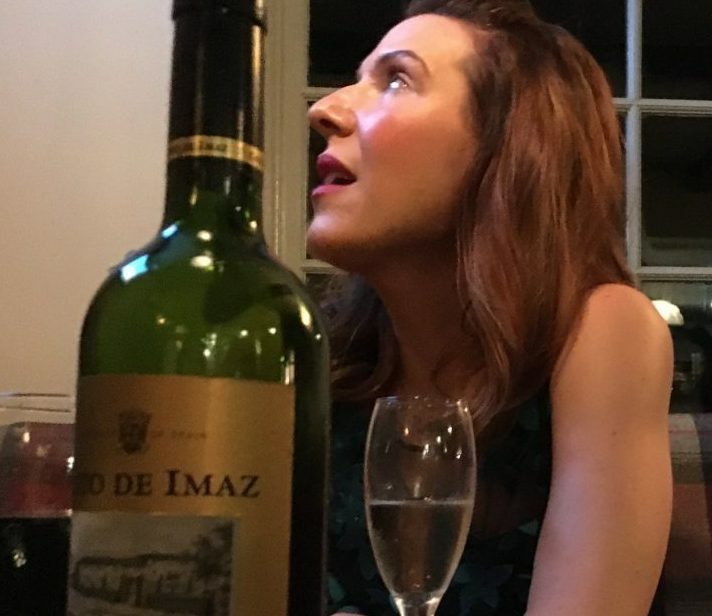 Of course every fine steak, should be accompanied with fine wine, and by coincidence one of our faves, a Coto de Imaz Gran Reserva, was on hand to make the occasion extra special. It was a juicy £40 a bottle, but worth every drop. The wine list is pretty extensive, with every hue, pocket and palette accounted for, so the only issue you’ll encounter is – which one? 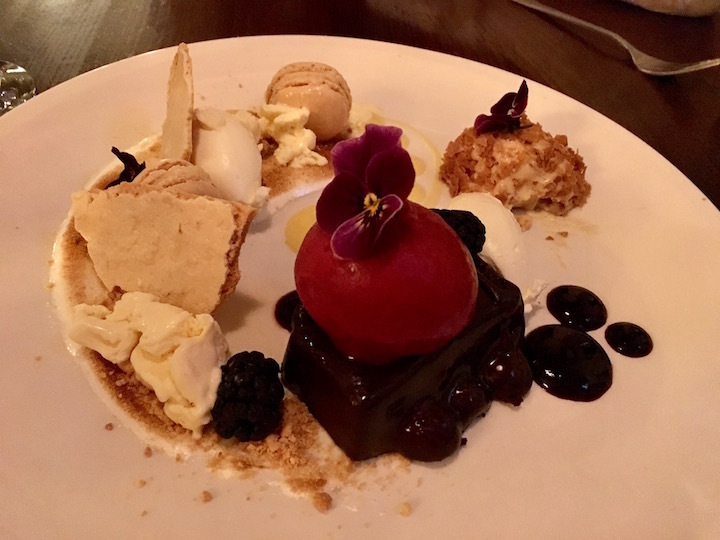 With the tasty challenge well and truly met, we went eye ball to to virtual eyeball with a specially prepared trio of desserts featuring a selection of the restaurant’s finest sweet treats. Lemon meringue – Lemon Pastry Crumble, Lemon Macarons, Lemon Curd, Italian Meringue, Meringue Shards, Chantilly Cream (I know already), a peanut butter frozen mousse – Chocolate Glaze, Caramelised Banana, Chocolate & Whisky Cremeux (Shall I just stop now? ), and finally Black forest Gateaux featuring blackcurrant sorbet and boozy cherries. Beyond delicious, if you needed any more convincing..
And that was the evening – it was very, very good, we slept like two fat logs. …only to help himself to some of the tasty scrambled egg off my plate. 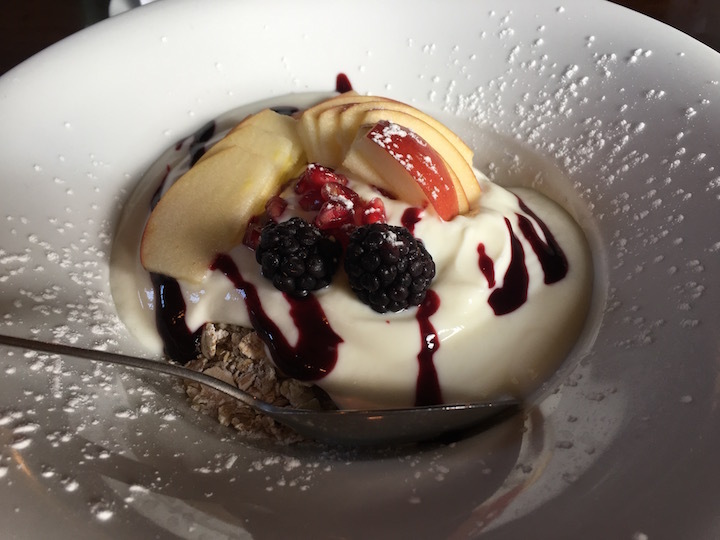 In fairness there was plenty go around, The Narrow Boat does not scrimp on it’s portion size, despite the fine dining on offer, morning, noon or night, and I’d definitely return (probably with a room because who wants to drive back with all that on offer?). Good for: Weekend breaks, secret dates, and catching up with mates. 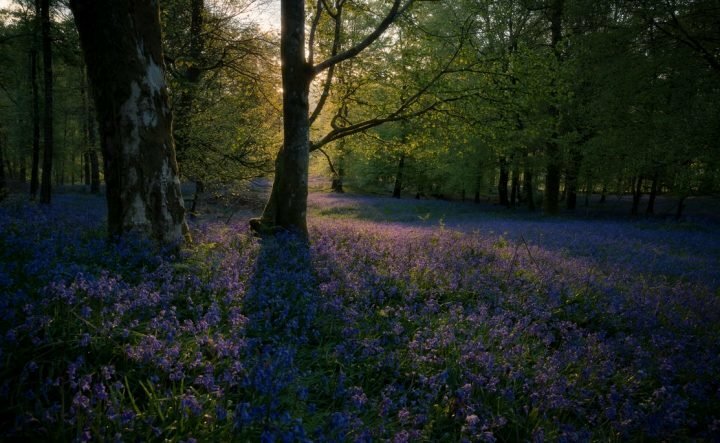 It’s a step into rural Northamptonshire, but offers the cuisine most often associated with larger towns and cities. There are seven exclusive, cosily furnished en-suite canalside rooms, and packages all include a full cooked breakfast. 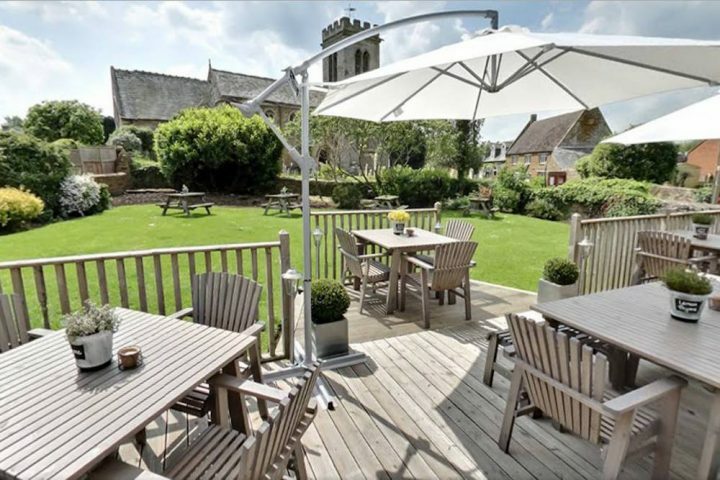 The rooms have been ranked as a AA 4 star silver inn, as if we weren’t impressed already. 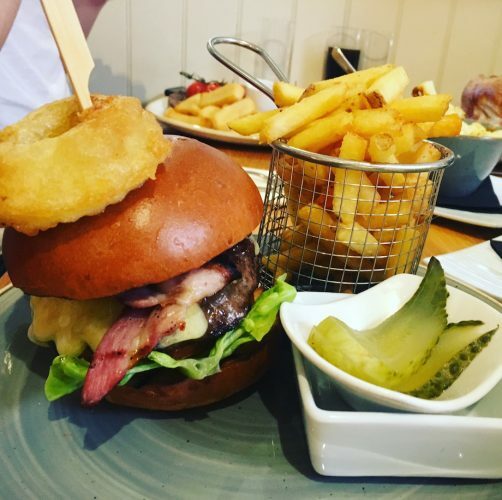 The nearby attractions make the stay an enjoyable and interesting one, unless of course you just fancy a quick walk down the towpath and an evening of food and wine instead of getting back into the car and exploring the local area. Go for the weekend and do both. Also, happy days, dogs are welcome in the bar area. Not for: Traditional pub goers looking for cheap and cheerful. 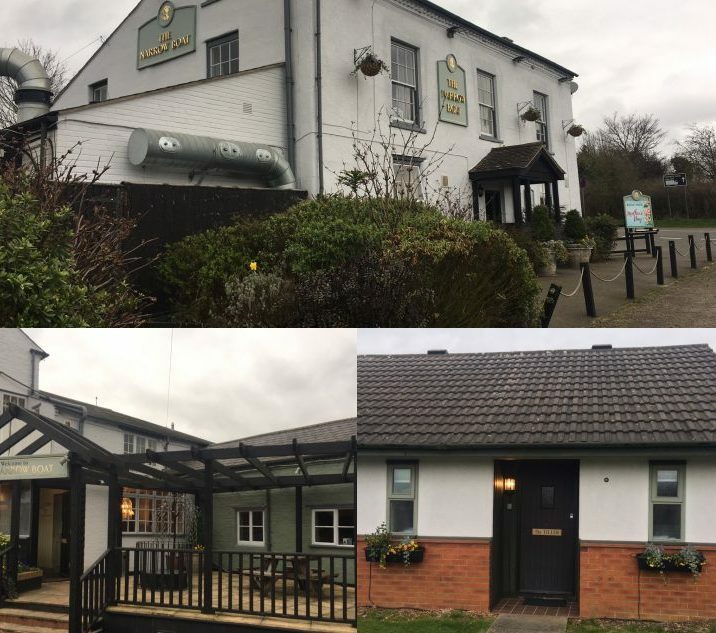 This pub/restaurant is the real deal and the ambition of Kirsty Collins, and The Narrow Boat management will keep this establishment on Northamptonshire’s radar for all the right reasons. 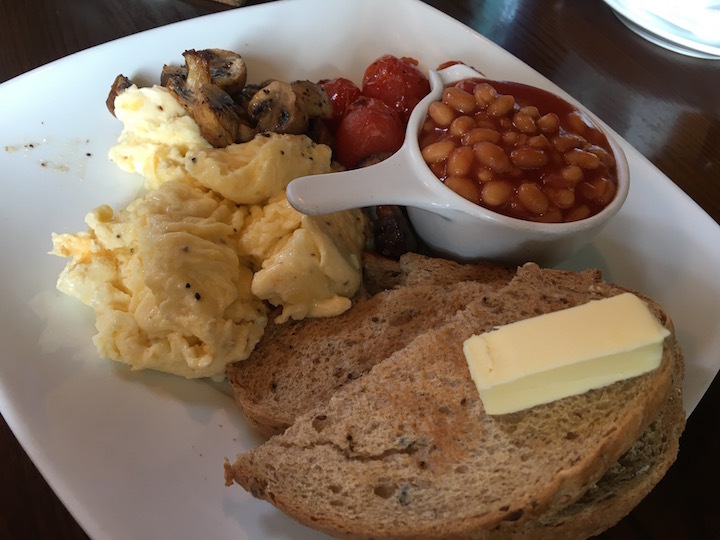 £££: The Food and drink menu at The Narrow Boat covers a lot of ground, and given the expertise on offer you can see why prices are towards the higher end. Starters and Desserts at c£7 and main courses from c£12 up, make this a tasty treat. 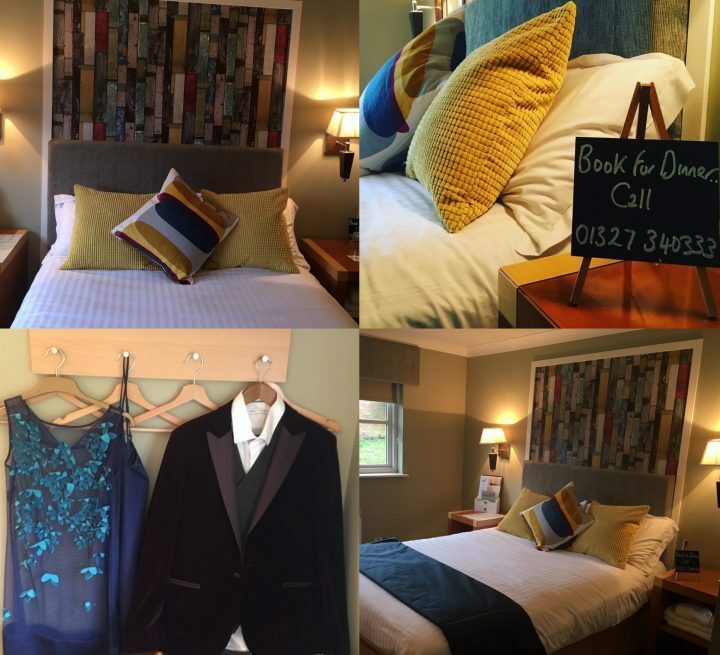 Combine all of this with great rooms rates (starting at £65 a night) and it really is a high quality staycation, left with the Muddy seal of approval. Oh – did you think the fun ended there? 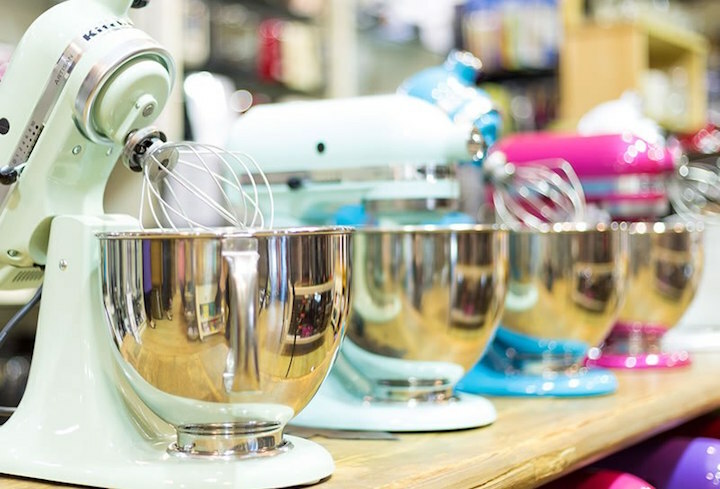 Not five minutes down the road from The Narrow Boat is Heart of the Shires, and notably for Mr Muddy “Kitchen gadget heaven” in the Abraxa cookshop. Several spent pounds after arriving we both left relaxed and in possession of yet another frying pan and zester and it was back to Muddy mansions only 24 hours after we’d originally left. Exhausted – not a bit of it – rested, well fed and ready for the working week.